Training Manual for the US Army in hand to hand combat. 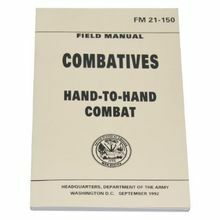 Originally published in 1954, the U.S. Army Hand-to-Hand Combat guide was the official field manual for soldiers. It covers hand-to-hand combat in all areas, with and without short-range weaponry, and includes training methods, defending and disarming methods, throws, holds, chokes, escapes, knife combat, dominant positions, and vulnerable body parts. This handbook is a useful and authoritative guide relevant for those interested in learning self-defense and close-range fighting techniques. Uses a specific system to teach soldiers techniques required to defeat an opponent in close or hand to hand combat. 168 Pages. Dimensions of the book: 5 1/4 x 8 1/2 .